This is something my MIL made couple of weeks back for lunch along with some sambar and curry. She made this as a side dish. I took the picture but didn't get time to write the post. I was just watching her when she made this dhall. It was super easy and was very delicious. Cook drumstick and moong dhall separately on stove top adding turmeric powder in both. Do not cook the dhall in pressure cooker(which I do every time to save time). Once both drumstick and dhall is 3/4th cooked, mix it in a same pan and add salt, pepper and cumin (can also use the mixture of pepper and cumin powder) powder. Let everything mix together and cook for another 5 to 7 minutes. Add water according to the required consistency. Turn off the stove when the raw smell of pepper and cumin goes. In a separate pan, pre heat oil, splutter mustard seeds, fry uradh dhall, red chillies and asafoetida, to golden brown and pour it on top of the dhall. Garnish it with curry leaves. 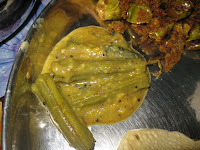 I had this along with rice in the morning and also as a side dish with roti in the evening. This dhall goes to CMT - Dhall/Kadi/sambar/rasam hosting by Priya, event by Jagruti. Hi friends. I will be taking a long break for eight weeks from now. We are leaving to India tomorrow and will be back only in August, I may or may not post recipes during this period. If time permits I will definitely check out the other bloggers recipes. Since my mother in law is the person from whom I learnt cooking, I will ask her to cook some new dishes and try to post it.